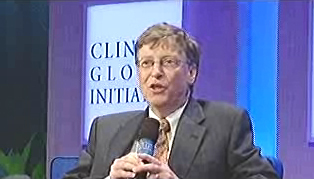 When Bill Clinton and Bill Gates get together for a conversation, what do you suppose they talk about? When they did so this afternoon before an audience at the Clinton Global Initiative, the word that cropped up most often was “fun.” For both men, concentrating on philanthropy after reaching what had been their ultimate career goal – for Clinton, two terms as President of the United States; for Gates, making billions of dollars creating and running Microsoft - has evidently been more than ennobling. It has been a source of enjoyment, satisfaction…no, the word is fun. Both men agreed that the challenge in fighting AIDS in developing countries is not only the price of drugs, but the absence of effective health systems to deliver care. Clinton turned to the challenges of giving money away effectively. He recalled an event he and Hillary Clinton had hosted at the White House nine years ago, centered around philanthropy, when Gates had stated that it might be harder to give money away than to earn it. He asked Gates how he went about deciding which projects to fund. Leaders of hundreds of NGOs in the audience leaned forward to hear Gates describe how his foundation selected its grantees. Gates alluded to the confidence he had that it was fine to make mistakes in philanthropy, so long as lessons were learned. In seeking a malaria vaccine, for example, he had to be willing to try 6 vaccines in order to increase the probability that they’d develop one that worked. That type of risk would not be tolerated in government-funded research, he pointed out, which is why government could not be as effective. In choosing which causes to support, he declared, a foundation should focus on a narrow set of things, and try to support them at a deeper and longer term level than if it spread its philanthropy too far and wide.